It’s been a while since I posted an Influenster VoxBox. I’ve definitely gotten some pretty exciting boxes over the past few years, but it sort of died down. 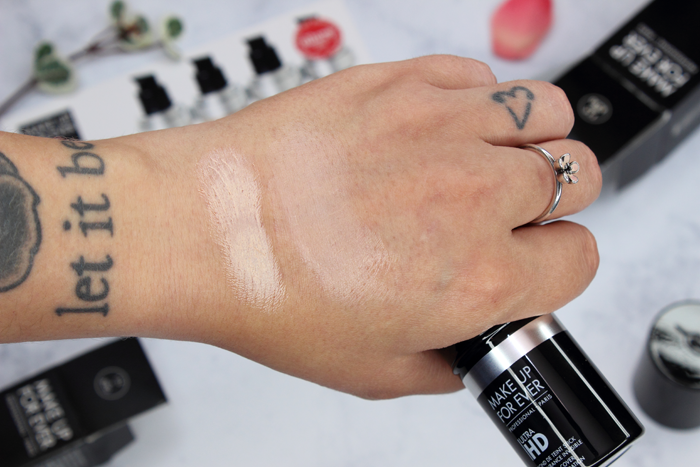 So I was pretty excited to see that I was in the newest Marc Jacobs Beauty Highliner VoxBox. I haven’t experimented much with the brand. In fact this may be my first time? I’m trying to remember if I’ve tried anything aside from fragrances, but nothing comes to mind. 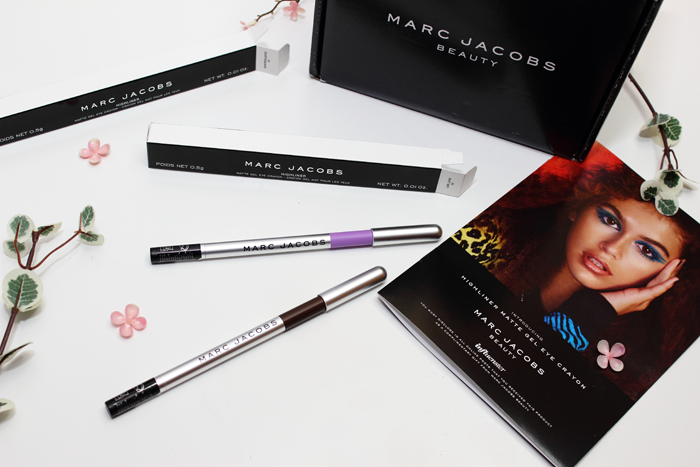 So what’s in the Marc Jacobs Beauty Highliner VoxBox? 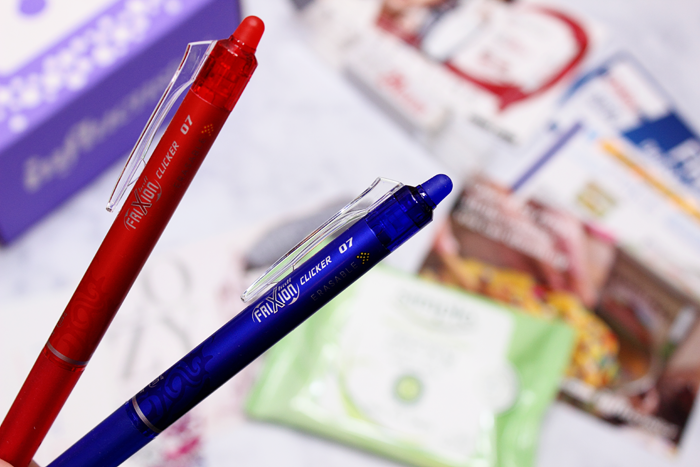 Two shiny new shades of the Highliner Matte Gel Eye Crayon Eyeliners! When I saw people’s photos floating around Instagram I was so hoping to receive some of the colorful shades. I got lucky and received (Earth)quake which is dark brown and totally wearable. And Mist Me? which is a lilac and totally satisfies that need for color! Even though I really had my heart set on Whirl(pool) which is the prettiest teal! Mist Me? is a little more unique in my collection though. 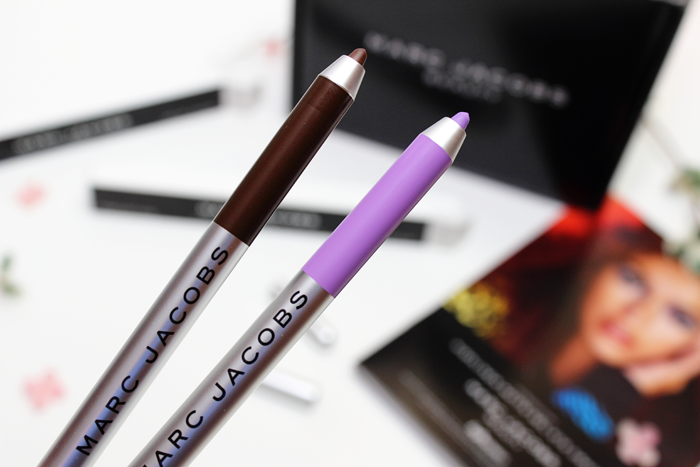 These Highliner Matte Gel Eye Crayon Eyeliners provide you with a bold matte finish. And they’re waterproof! 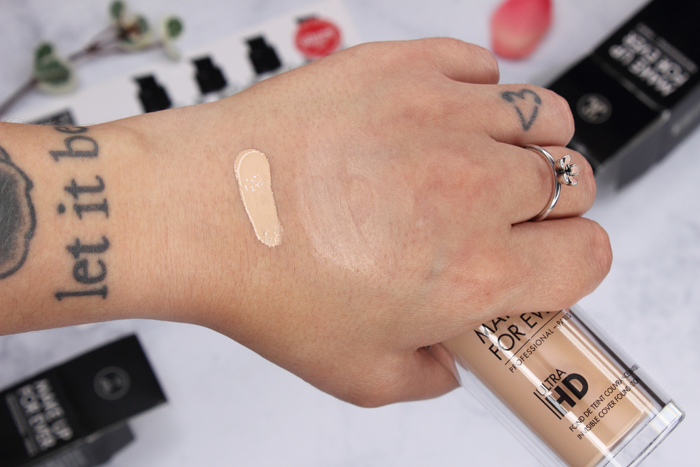 I had to use makeup remover to remove my swatches. Sometimes I’ll just use soap and water, but these wouldn’t budge. 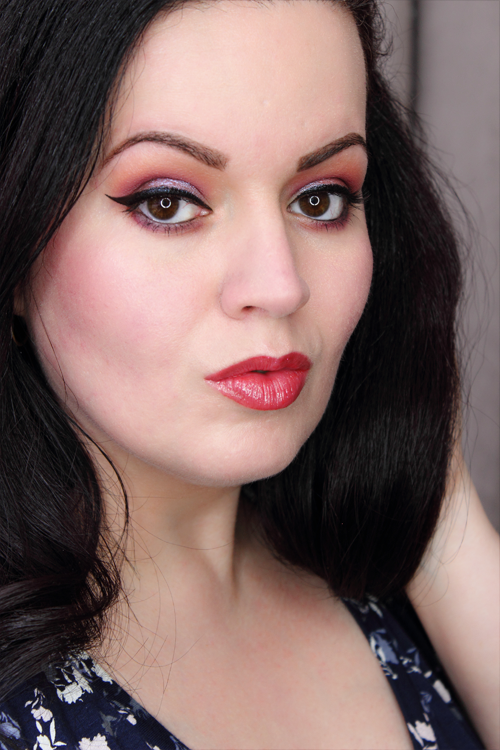 When they say these liners glide on smoothly they aren’t kidding! They’re so creamy too! Once you apply them you have about 15 seconds before they set. So you’ll want to work quickly. 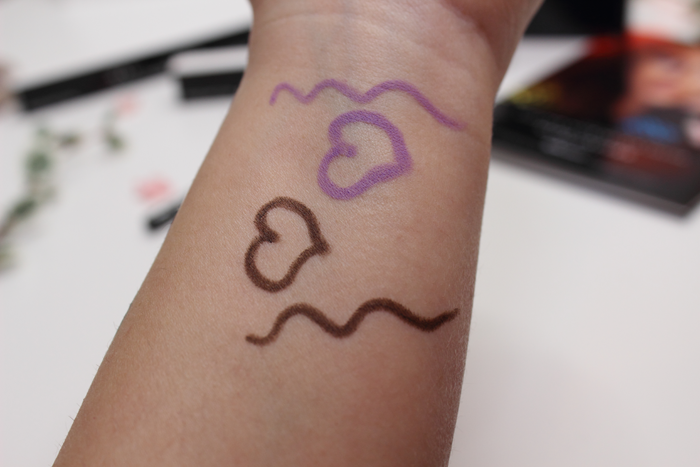 I found these eyeliners to be incredibly easy to work with. 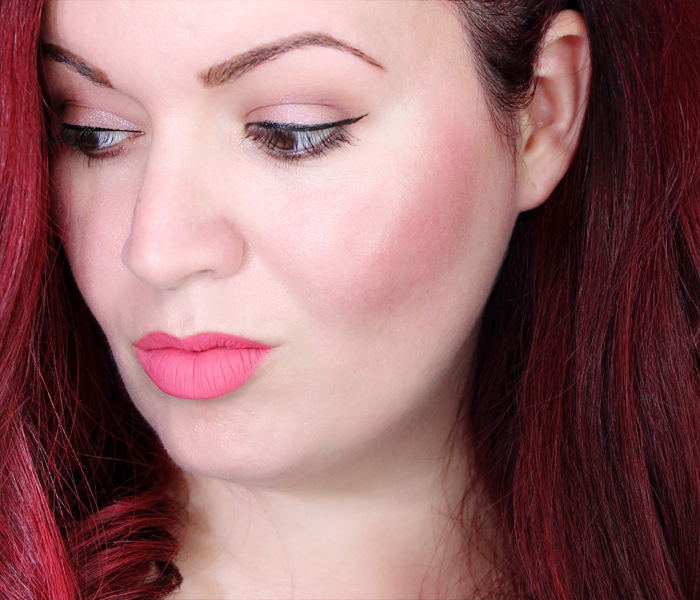 They applied and blended beautifully! I’m really happy with the shades I received and I’m thinking of buying a few more. 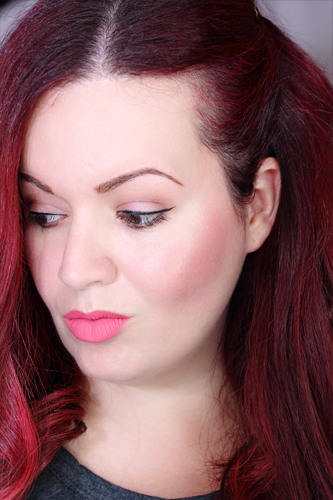 After watching Samantha Schuerman’s review I’m convinced I need Pink of Me. And of course Whirl(pool) because it’s just so beautiful! 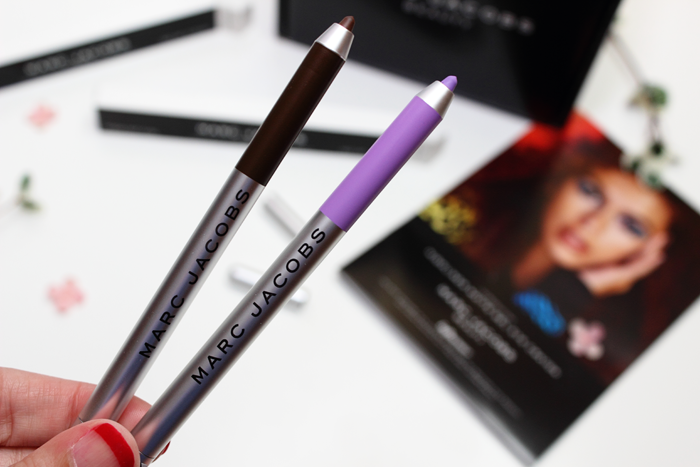 Have you tried the Marc Jacobs Beauty Highliner Matte Gel Eye Crayon Eyeliners? Do any of the shades catch your eye? 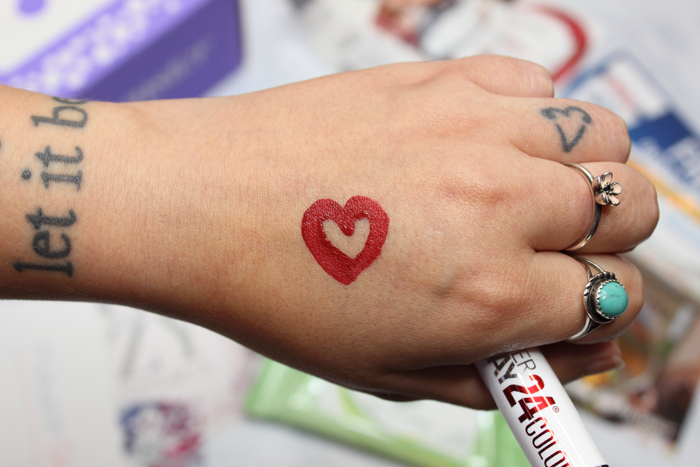 The newest VoxBox I received is called the Cozy VoxBox. 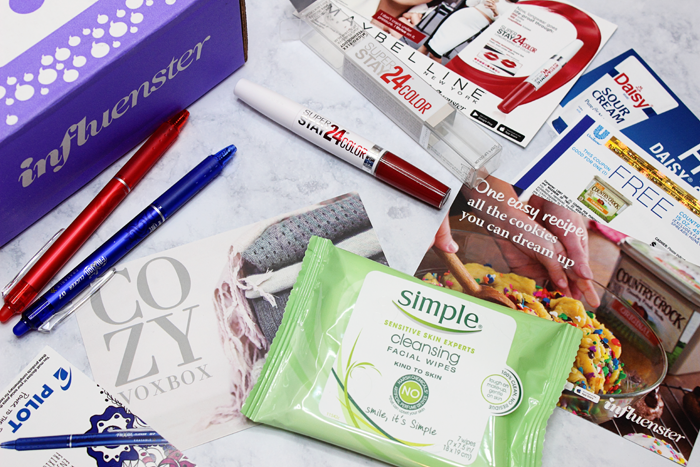 This VoxBox is said to contain products that are sure to get you through Fall! Let’s take a look at what’s inside! 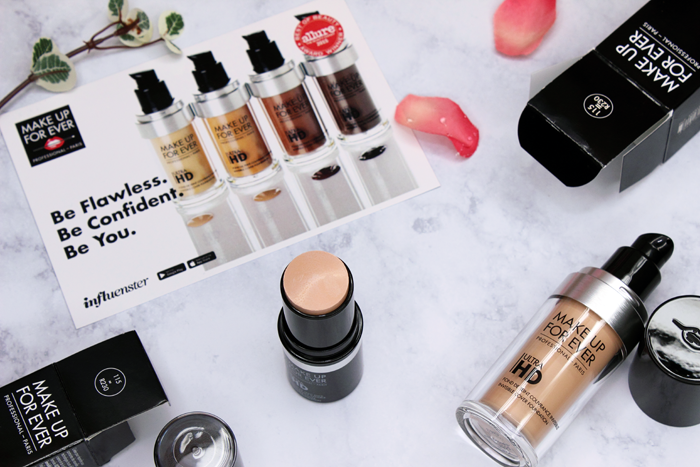 I’ve received quite a few Simple Skincare products in previous subscriptions boxes and have liked the products so much that I’ve purchased full sizes. I’ve even purchased these wipes and I really like them. They’re definitely good to have on hand. 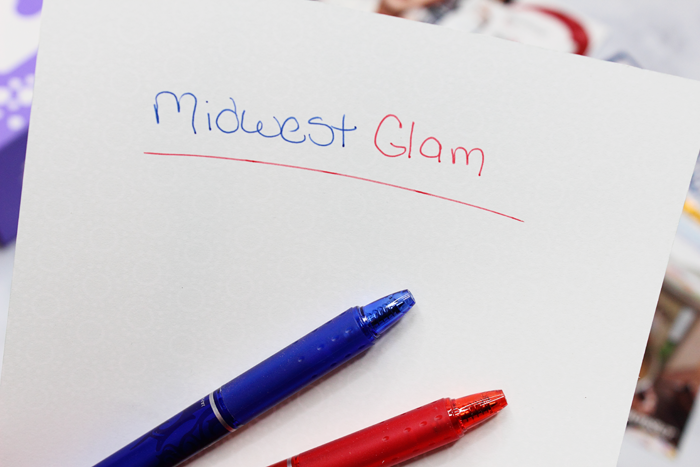 Especially for a beauty blogger! I was happy to see this little gem included in the box. I received the shade 25 Keep Up The Flame. It’s a beautiful red shade. On one end you have the lip color which gets applied first. On the other end you have the ultra-conditioning balm which seals in moisture. This gets applied after the lip color has fully dried down. You will need an oil based makeup remover to remove it. I really like the shade. While it’s nothing overly exciting, you can’t go wrong with a nice long lasting red! And it is long lasting! I don’t know about the 24 hour claim though. I’ve never worn my makeup that long. It applied nice and evenly. It was pretty comfortable and didn’t feel drying. I like this lipstick a lot. I’ll definitely pick up a few shades. But probably not too many because there really isn’t a lot of product in that tiny tube. Which is my only complaint. These pens are pretty cool looking. They’re retractable and erasable! My son was pretty excited to try them out and insisted that I give him the blue one. He has a thing for pens and pencils. If he says it’s good… it’s good! I actually don’t use sour cream unless I’m baking. I love adding sour cream to baked goods. I have a few cupcake recipes that call for sour cream and it really makes for a more moist and rich cupcake. Daisy is the only brand I buy too. So I definitely put the free product coupon to good use. And right in time for all of the holiday baking! I remember this big ol tub of butter sitting in my fridge when I was younger. It was my parent’s brand of choice. I personally use a non-dairy brand for myself. However, when I bake I use dairy based sticks. And that’s what this will be used for. I guess by Cozy they meant sitting at home under a big warm blanket munching on cookies and cupcakes. Hah! This was a fun box! Everything I received is either something I purchase regularly or something I would consider purchasing. I especially like the addition of the sour cream and butter because like I said, tis the season! I’ve got a ton of baking to do!